Photograph, Picture of Albert Collins. Courtesy of the Mutual Musicians Foundation. Image available on the Internet and included in accordance with Title 17 U.S.C. Section 107. COLLINS, ALBERT (1932–1993). 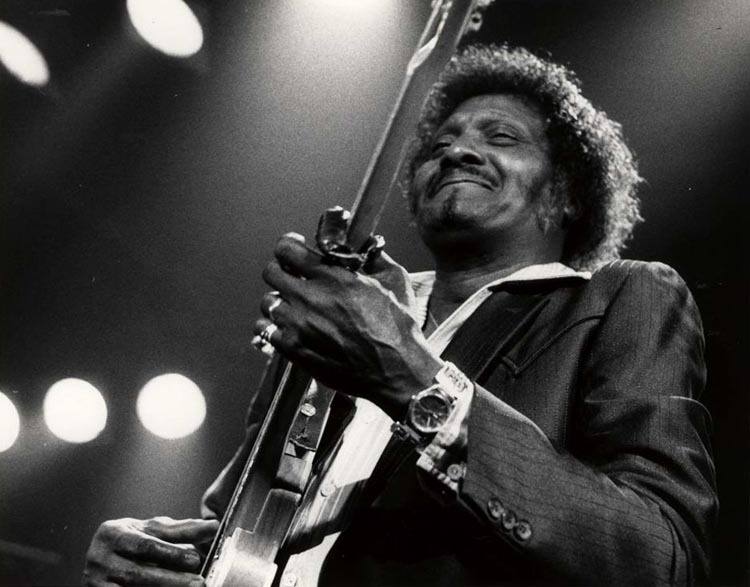 Albert Collins, blues musician, was born on October 1, 1932, in Leona, Texas. He was the son of Andy Thomas. The family moved to Marquez when Albert was seven and to Houston when he was nine. He started his music career in Houston in 1952, recorded his first single, "The Freeze," in 1958 and the first of fifteen albums, The Cool Sound Of Albert Collins, in 1965. His skill with his guitar of choice, the Fender Telecaster, inspired his nickname "Master of the Telecaster." He was also known as the "Iceman." He became famous for walking into the audience, and on one occasion into the parking lot, with a 300-foot extension cord, followed by the audience. Collins used his fingers, not a pick, to play the guitar; unorthodox minor tunings and a capo on the fingerboard produced his unusual sounds. In the early 1960s Frosty became his first gold album. In 1965 Collins moved from Texas to Kansas City, Missouri, and eventually to California about 1967, where he performed with the group Canned Heat. He released his album Love Can Be Found Anywhere on Imperial in 1968. Although he had numerous regional hits recorded on small labels in the 1960s and 1970s, in the late 1970s he signed with Alligator. His 1978 Ice Pickin' won the best blues album award from the Montreux Jazz Festival and was nominated for a Grammy. In 1983 he won the W. C. Handy Award for best blues album of the year with Don't Lose Your Cool. He performed at the Live Aid concert in 1985, and in 1986 he shared a Grammy for Showdown! That same year he was inducted into the Blues Foundation Hall of Fame. 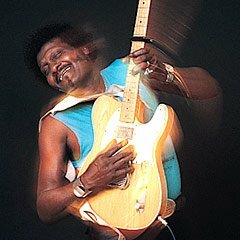 Photograph, Picture of Albert Collins in action. Courtesy of Alligator Records. Image available on the Internet and included in accordance with Title 17 U.S.C. Section 107. By the 1990s he had played in Carnegie Hall and appeared at the Live Aid Television benefit. His last album, Molten Ice, was released in 1992. A favorite in Austin, Collins yearly played three or four two-night stands at Antone's, a local club, and in 1991 taped a BBC special there. He also played at the annual Aqua-Fest and appeared on the PBS show Austin City Limits in 1991. He died of cancer in Las Vegas, Nevada, on November 24, 1993, and was buried in Davis Memorial Park in Las Vegas. He was survived by his wife Gwendolyn. Several live albums and videos were released in the years following his death. Austin American-Statesman, November 25, 29, 1993. Colin Larkin, ed., The Guinness Encyclopedia of Popular Music (Chester, Connecticut: New England Publishing Associates, 1992). Newsweek, December 6, 1993. Handbook of Texas Online, John G. Johnson, "COLLINS, ALBERT," accessed April 21, 2019, http://www.tshaonline.org/handbook/online/articles/fcowg.